As with last week’s post, I’m going back through a handful of pieces I’ve written in recent years, but never published. I’m amazed sometimes at the things God once taught me but slipped to faint and distant memory. I hope this touches you today. I heard that humorous warning about aging in a sermon once. I don’t recall the rest of the lesson at all. That line was so catchy, I kind of got stuck there. But recently, the gravity and art of aging has intrigued me. Maybe it’s because my refrigerator is camouflaged in pictures of my nieces and nephews. Kylie, the oldest, isn’t quite three; baby Acelynn hasn’t even had her first birthday. Right alongside images of first steps, yogurt-smeared chins and sparkly, wide eyes, is a photo of my grandmother. She turned 91 this year. Granddad died a few years ago. Since then, almost spry as ever, she has lived alone a few hours from my parents’ house. The only signs of her age are fading hearing, a tremor when she tries to hold her head perfectly still and she walks a bit slower than she used to. Or maybe, I’m contemplating these seasons of life because I volunteer doing pet therapy with hospice patients. I heard of a man who recently decided he’d like a visit. It took them months to convince him he would benefit from a few hours with a dog. Stubborn, he kept telling his son and nurses that he wants his own dog, not simply a visitor. He knows what they say is true, that it wouldn’t be fair to the dog. He’s too old and ill to care for it properly. He may not live much longer and then who would take care of his furry best friend? Brave and I will meet Mr. Thurston next week for the first time. Or maybe it’s because a few weeks ago Brave and I attended a grief camp for children who have lost a loved one in the last two years. However unfair, they were thrust into an unexpected season, one with a stark awareness of death. For many of them, the loss will mean a drastic change in their lifestyle. Who will tuck me in at night? I might be thinking about birth, aging and dying, youth and the elderly, old and new because a friend just told me that he and his wife are finishing their basement so that his father can move in with them. It’s only been a few short years since they tenderly cared for his mother in her final days. Whatever the reason, the seasons of life are turning in my head. But it’s much more than a solemn observation of finite lives. It’s more of an interest in how these season change us, not just our appearances and abilities, but change the way we live our lives. Passing years change our lifestyles, our priorities, our waking thoughts and unremembered dreams. It’s not surprising that Paul includes that sentence in, “The Love Chapter”. The most important way that time changes us, that age matures us, that the end sobers us, is that we fall more in love with the timeless. Time as we know it nears its finale, and our attention is swept up by the eternal. Our love shifts to things of an infinite nature—the promises of our Creator, the surety of seeing His face, the eternal spirits of our loved ones. Our lives necessarily change to accommodate these newly found truths. Our bodies slow down as God allows age to limit our lifestyle, to force us to take closer, longer looks at what really matters. It is in the slowness, even the stillness, that we know He is God. And in that knowing, we are so much closer to all we’ve ever hoped for–to be fully real, fully known and fully loved. God got on a soapbox this week. 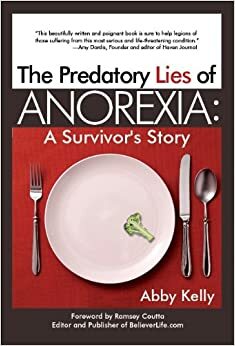 It’s kind of funny—God has used my eating disorder and the recovery process to shape me in so many ways; now most of what I learn and read is filtered through the lens of overcoming addiction, idolatry, fear, shame and the myriad other emotions connected to an eating disorder. I examined the article in that light. The cool things is, these stimuli don’t affect me in the same way they used to. I still eat all my meals. I have no interest in working out like a fanatic. For all practical purposes, I’m still healthy—and I’m happy. But I’ve also felt an internal shift, a change in my affections and focus, a difference in what my mind dwells on in moments of inactivity. I’ve been wasting valuable mental energy planning tomorrow’s workout. In the evening when my husband and I watch television together, I’ve been distracted by searching for new recipes or reading the blog by a new favorite fitness professional. These little habit changes wouldn’t raise a red flag for most people. In fact, most would probably see them as a positive interest in health and good nutrition. But I know my heart, I know my tendencies. I know my proclivity to bend a knee and subtly worship my body and things that pertain to it. I’m praying about this, asking God to reorient my priorities. I’m leaving the smart phone in the other room. Modern culture bombards me with a constant stream of information, images, suggestions and ideas—and I become what I behold. The longer that I gaze at any form of media, feasting my mind on culture’s obsession with appearance, I cannot help but begin to assume that mold. I want to look like Christ, not a one-dimensional supermodel. I must divert my eyes from the colorful attractions and preferences of the world and fix them on Jesus. Few of us would swoon if our husbands compared us to a horse. In fact, using today’s connotations and implications that might get your man slapped! Today, however, I heard an interpretation of this little verse that changed my perspective not only on being horse-like, but on the biblical concept of being a helpmate to the leadership role of my husband. Gary Thomas, in his book Sacred Marriage offered an explanation that I’d never heard before. Apparently, mares were rarely harnessed to a Pharaohs’ chariot. Generally, because speed and power were desirable, Pharaohs used the brawniest stallions to do this work. But they found that when they harnessed a mare among the stallions, she produced in them such a frenzy that they drove harder than ever. What do you bring out in your husband? When you spend time with him, work beside him raising your family, speak to him–what character qualities and attitudes do you cultivate? Does he leave your presence more determined than ever to be a servant leader or a committed father? Does he feel stronger, more confident, more capable than he did before? Women, we have a lot of power. To listen to the culture, you wouldn’t think so. Collectively, we clamor for more power and equality. But I think this tactic is evidence of the way we often wield our power–manipulatively, subversively. This calls for extra care–prayer–in our words and deeds. Next time you are tempted to blame your husband for something or harass him for failing to live up to your expectation in some way, consider first what attitudes, qualities and actions you have cultivated in him. You are his helpmate, harnessed alongside him for a good purpose. Your mere presence can multiply his power and productivity in life. Don’t take this lightly. The country is in a tizzy over who will be the next President of the United States. And, while it’s incredibly early to place much weight in polls and predictions, it’s never too early to begin praying about the outcome. The issues inciting voters are not so varied either. The economy and international relations are at the top of the list. There are plenty of moral issues at stake as well—the right to life and racial tension. And, for the most part, the American public is tired of political games—tired of politicians. So, outside of the debates and the arguably biased news coverage of each candidate, how does a Christian make a well-informed decision about who to vote for? Is there a single set of standards anywhere that can help believers draw clean lines between the options? I never expected to find such a precise set of standards in the book of Psalms. But, it shouldn’t surprise us. After all, much of the the book was penned by King David of Israel. And the rest were penned by those who knew him and were affected by his rule. The Bible describes David as “a man after God’s own heart.” It makes sense then, that David’s personal and prayer life can guide us in making godly decisions about those who govern our own lives. These verses speak very obviously to the campaign season. How many candidates spend much of their air time slandering their opponent or speaking evil against him—often times even taking up a reproach against a former ally for the sake of popularity? And, while none of us on our own can claim to be blameless, a man or woman who has accepted the free gift of Christ’s sacrifice for sin is completely blameless. They also seek to do right and speak the truth. This verse brings us to the moral issues. Which candidate consistently calls good good and evil evil? A specific case in point: Who is willing to stand up for life? Politicians are notorious for saying one thing during their campaign and doing another once they’re in office. The Bible tells us to look for a man who swears to his own hurt and does not change—this man or woman will not change their stance for truth even when it’s not in their personal best interest. This verse covers a whole gamut of issues. As voters, we must vote for the candidate who—to the best of their ability—manages the country’s finances well, refuses to be bought and protects the innocent. Finally, the last sentence sums it up. Do we not want to be a solid, unmovable country? This begins with an uncompromising, strong, unmovable leader. The Bible tells us clearly how to vote. Is our responsibility as believers and patriots to determine who to vote for.